There are many ways to make a box for dispensing plastic bags for picking up dog waste. Below are ideas for making boxes for dispensing bags. This box is made by SImply Human and was purchased at Target for $10 (though Target no longer carries it, you can purchase it online and sometimes from Walmart.) 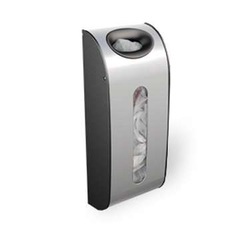 It was designed to hold plastic grocery bags. We turned it upside down and painted it with primer and then with outdoor paint. We then sealed it with a spray clear coat varnish. It comes with holes in the back that are perfect for mounting with bolts, ring washers, and nuts. Some of the Mess Mitt boxes in the neighborhood are 7 years old. Eventually, the paint chips off, but the boxes themselves hold up well Speaking from personal experience, we find that the long orange and green bags that newspapers come in make excellent dog poop dispensing bags. You can also make a box from an upside down gallon plastic milk jug. Cut a small hole in the side for filling it with bags. Punch 2 holes in the back so that you can fish a wire through for attaching to a sign post. 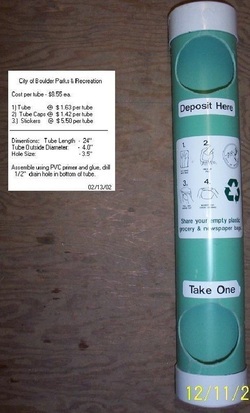 Link to making dog waste bag dispensers made of PVC pipe. GDNA Resident Linda who lives in the Southeast Quadrant (Columbus to Swan, Pima to Speedway) was having a problem with people not picking up after their dog. She went to the Dollar store and bought a plastic food container and a roll of small wastebasket size plastic bags. She cut a slit in the food container, put the roll of bags inside, and hung it up on the NW corner of N. Catalina Ave. and E. Bellevue St.. It is a work in progress in that she wound the towels around a paper towel tube to make them pull out easily, but she has since discovered that there is a slit in the bag the bags come in for pulling them through. She has seen a big decrease in dog waste on the street.